"As the name suggests, this cake is made without eggs." Sift the flour, baking powder and baking soda together in a large bowl. Make a well in the center and pour in the sweetened condensed milk, orange juice, vanilla and melted butter. Mix well and pour into prepared pan. 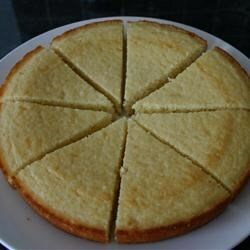 Bake in the preheated oven for 30 to 45 minutes, or until a toothpick inserted into the center of the cake comes out clean. Allow to cool. Excellent! My daughter is allergic to eggs, and has never had cake that really tasted like cake! Until last night! Thanks for sharing this wonderful recipe, Margaret!